See All Issues from May 2017 forward​​​​​​​. The Senate Health and Human Services Committee reported legislation on April 10 that would delay the transition of the Medical Assistance Transportation Program (MATP) to a statewide or regional brokerage system. At the last minute as the FY 2018-2019 budget was being finalized last June, language was tucked into what became Act 40 of 2018 to require the Department of Human Services to seek federal approval to move nonemergency MATP services to a statewide or regional full-risk brokerage model. Since Act 40 was signed into law, counties have raised numerous concerns about access, flexibility and a lack of understanding of local needs and resources, which could potentially increase costs long-term or hinder this critical service for individuals who are reliant on it. Senate Bill 390, introduced by Sen. Lisa Baker (R-Luzerne), would suspend the move to a brokerage model until 90 days after the Joint State Government Commission conducts a study on the impacts to each county. The Commission would have up to a year to produce the study once the bill becomes law. The bill now goes to the full Senate. Similar legislation, HB 986, has been introduced in the House by Rep. John Hershey (R-Juniata). On April 10, Sen. Baker and Rep. Hershey, along with additional House prime sponsors Rep. Aaron Bernstine (R-Lawrence) and former CCAP members Rep. Jonathan Fritz (R-Wayne) and Rep. Pam Snyder (D-Greene), held a press conference in support of both bills, noting that the response to Act 40 has made it clear that one-size-fits-all might not be the best approach. They added that local decisions are important, and counties know the people they are taking to appointments every day, so there is a need to press pause on the transition to see how it impacts Pennsylvania's most vulnerable citizens. The Senate State Government Committee has voted 6-4 to approve SB 48, introduced by Sen. John Gordner (R-Columbia), to provide some procedure for decertification of voting equipment by the state. Specifically, the bill would require the Department of State, in circumstances where 50 percent of the counties are affected, to develop and submit to the General Assembly a justification and plan for decertification and for replacement of the equipment, including timelines, costs, and funding sources. In turn, the General Assembly would create a commission to review the plan, and to make findings and recommendations, including potential legislation, relative to it. The committee adopted a technical amendment by a 6-4 vote, which included provisions specifying that the two members of the commission appointed by the Governor must be a county commissioner and a county election director, and that the commission would include legislators from each of the four caucuses. Two weeks earlier, the State Government Committee held a hearing on SB 48, which included a panel on which CCAP's Doug Hill participated, along with Snyder County commissioner and CCAP Elections Reform Committee co-chair Joe Kantz, Dauphin County commissioner Jeff Haste and Montgomery County commissioner Ken Lawrence. During that hearing, Hill reiterated that while counties would have preferred the discretion to move forward on their own timelines, the Stein settlement setting an April 2020 deadline is legally binding and thus counties are working diligently to meet its requirement. Critical to that effort is focusing now on working with the administration and General Assembly to maximize the level of state funding available for equipment replacement, and to compress the funding timeline, ideally to a single year, so that counties can limit the burden on local property taxpayers. Hill noted that while counties appreciate the sponsor's support for county discretion in this matter, the legislation is likely to encounter a gubernatorial veto given its inconsistency with the settlement agreement, and counties are too far down the road in the equipment procurement process for the legislation's immediate effective date to allow a change in course now. On April 8 the House State Government Committee heard from Acting Secretary of the Commonwealth Kathy Boockvar and from Lycoming County director of elections and registration Forrest Lehman, on the status of voting system replacement efforts in Pennsylvania. Boockvar indicated that new voting systems are needed because current machines are reaching the end of their useful lives, security standards have been updated, and the federal Department of Homeland Security has called for all voters to be using voting equipment with a paper audit trail. In addition, litigation with the Stein campaign had been settled by requiring Pennsylvania to have in place voter verifiable paper trail equipment by the April 2020 primary election. Boockvar shared her belief that all three levels should play a role in funding the elections; she noted the $14 million in HAVA funds already provided by the federal government, and if the Governor's proposal to provide 50 percent of the cost in state funding moves forward, that would mean less than 40 percent of the cost would need to be funded by the counties. From the county perspective, Lehman expressed his concerns regarding the Stein decision as well as the process for decertifying existing voting equipment, which has created a timeline to purchase new voting equipment that is rushed both in terms of determining how counties were going to fund the purchase and the availability of certified equipment. He asked that the General Assembly support funding to the counties. Lehman's full comments are available at www.pacounties.org by clicking Legislative Testimony on the Legislative Action Center. Following action previously taken by the Senate, the House has approved its version of legislation to reauthorize the 911 Public Safety Emergency Telephone Act.The 911 Act signed into law in 2015 was a comprehensive rewrite of the original 1990 statute that improved system administration and coordination and provided a more sustainable financing structure. It was scheduled to sunset in four years, on June 30, 2019, and so reauthorization is now needed. On April 8, the House unanimously approved HB 859, offered by Rep. Stephen Barrar (R-Delaware), chair of the House Veterans Affairs and Emergency Preparedness Committee, which would offer a four-year extension of the Act. The bill now goes to the Senate, which had approved and sent to the House SB 127, introduced by Sen. Mike Regan (R-Cumberland), in late March. The Senate version would offer a two-year extension rather than four, and also calls on the Legislative Budget and Finance Committee to review the law and make recommendations prior to December 31, 2020. In addition, it makes several small substantive changes to the makeup of the state's 911 Board, and would permit PEMA to use discretionary funds under the law to purchase a statewide system to allow individuals to have their disabilities associated with a phone number, so a 911 operator would have access to that information during a call. Ultimately, a compromise between the two approaches will need to be approved to move to the Governor's desk. Adding to the 50 new members of the General Assembly who were sworn in at the beginning of the 2019-2020 session, several additional members have since been sworn in following special elections in the past few months. The newest members of the House include Rep. Movita Johnson-Harrell (D-Philadelphia), who was sworn in to the House in March to represent the 190th district seat following the resignation of former Rep. Vanessa Lowery Brown, as well as Rep. Bridget Kosierowski (D-Lackawanna), who now represents the 114th district seat formerly held by Sid Kavulich, who passed away last year. In a special election on April 2, Pam Iovino (D-Allegheny) was selected to represent the 37th Senate District, filling the vacancy left by former state Sen. Guy Reschenthaler after his election to Congress last November. Senator-elect Iovino will soon be joined by two other new Senators, following special elections that coincide with the May primary for the 33rd Senate District (Adams, Cumberland, Franklin, York), previously held by Richard Alloway, and the 41st Senate District (Armstrong, Butler, Indiana, Westmoreland), vacated by Don White. Another House seat special election is set the same day for the 11th House District in Butler County, following the recent resignation of Brian Ellis, as is a Congressional seat in the 12th House District in north-central Pennsylvania, following the resignation of Tom Marino. The state Senate and House of Representatives unanimously approved SR 66 and HR 168, designating the week of April 8 as Local Government Week and April 10 as Local Government Day in Pennsylvania. The resolutions were offered by Senate Local Government Chair and former Lancaster County commissioner Sen. Scott Martin and by House Local Government Chair Rep. Dan Moul (R-Adams) respectively. April is also National County Government Month, with a theme for 2019 of "Connecting the Unconnected" focusing on how counties deliver people-centered services to their residents. More information and resources are available at www.naco.org. 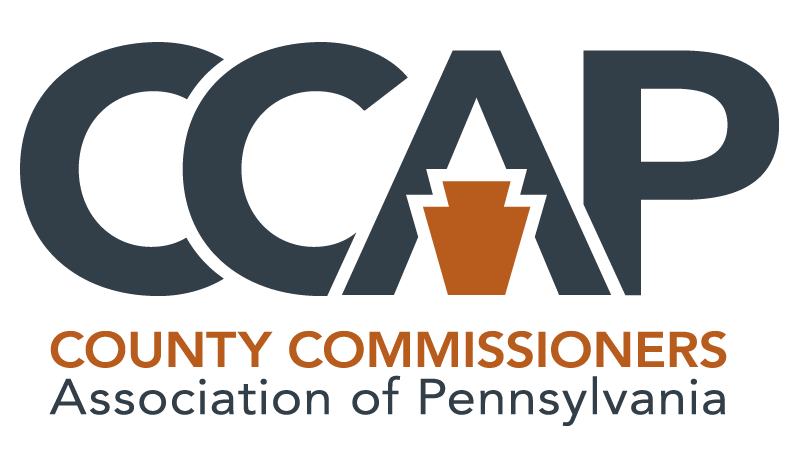 Throughout the month of June, CCAP policy committees will be holding their annual conference call meetings to consider resolutions amending the PA County Platform, in anticipation of a membership discussion and vote in conjunction with the CCAP Annual Conference in early August. County officials are encouraged to begin reviewing the Platform now and to send any proposed resolutions to CCAP Government Relations staff at PACountiesGR@pacounties.org, or to discuss them with CCAP policy committee chairs.